Thanks for the review. I've been interest in this book for a while. Is it fair to say that it distinguishes happiness from ungrounded wishful thinking? Absolutely, it is an argument for realism, which doesn't preclude happiness. I am extremely disappointed by this book. It offers nothing but an extremely reductive, boring and unproductive materialism that allows for no variation in worldview. 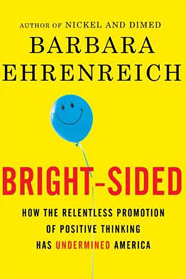 I was also unpleasantly surprised by Ehrenreich's atempt to bblame the current economic crisis on self-help gurus and the positive thinking movement. As annoying as life coaches might be, I don't think it makes sense to try to whitewash the Wall Street crooks and blame their crimes on self-help books.